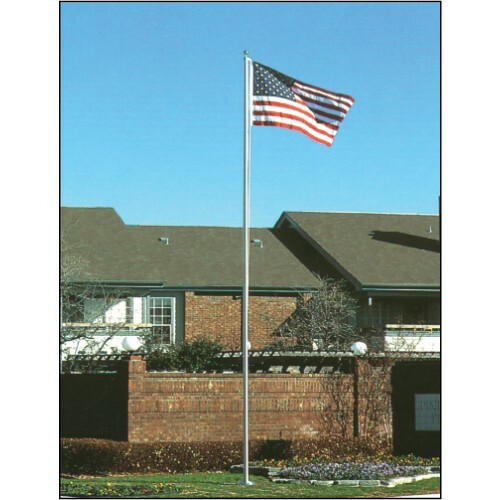 Choose our Estate flagpoles when you want a strong pole and a prestigious look. Especially when flying a U.S. and State Flag. All Estate poles are one piece, tapered aluminum. Standard fittings include a gold anodized spun aluminum ball, cast aluminum stationary truck assembly with cast nylon sheave, cast aluminum cleat and braided polypropylene halyard with nylon snaphooks. Ground setting tube and installation instructions included. Note that Estate poles will ship common carrier. We will figure the shipping for you and email the cost when we receive your order. As always, call our Marketing Consultants with your questions. 1-800-332-8730.